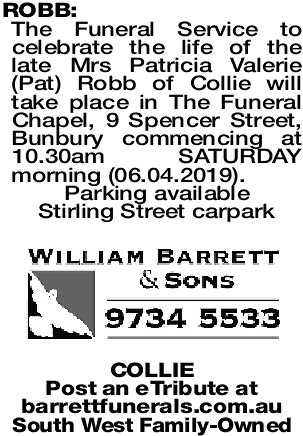 The Funeral Service to celebrate the life of the late Mrs Patricia Valerie (Pat) Robb of Collie will take place in The Funeral Chapel, 9 Spencer Street, Bunbury commencing at 10.30am SATURDAY morning (06.04.2019). Passed away peacefully at Valley View, Collie on 28.03.2019. Dearly beloved Wife of Jack (dec). 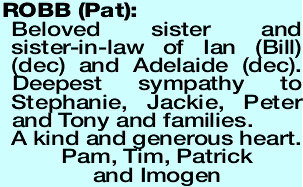 Much loved Mother and Mother-in-Law of Peter, Stephanie, Jackie and Wal, Tony and Debbie. Cherished Grandma and Grandma Pat of Megan and Adam, David and Jo, Peter, Elisha and Daniel, Tristan and Simone, Michael and Sarah, Kalan and Emma. Beloved Great Grandma of Ethan, Alex, Thomas, Chelsea, Ezra and Hamish. Mum, words cannot express the sadness we all feel. We will cherish our time together. We are grateful for your generosity and love and will miss you every day. Rest in peace. Dearly loved Mother of Jackie and Wal. Much loved Grandma and Grandma Pat of Megan, David, Adam, Jo, Ethan, Alex, Thomas and Chelsea. A generous and loving Mother and Grandmother who will be sadly missed by all. Beloved Mother of Stephanie and Peter. Cherished and adored Grandma and Grandma Pat to Peter, Michael and Sarah and Great- Grandmother of Hamish. You passed away peacefully but the treasured memories will remain always. Grandma, I love you, so much. There is no describing the sadness. You took all my sadness away and, as only you can, will continue to do just that. Our special bond, forever. Together, forever. Your utterly adoring grandson, Peter. ROBB PAT Loving sister of Sam and sister-in-law of Kevin (dec). Loved Aunty of the O'Reillys and Families. A long life shared and will be sadly missed. RIP. 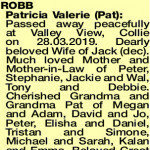 ROBB PATRICIA Lovely memories of Aunty Pat. 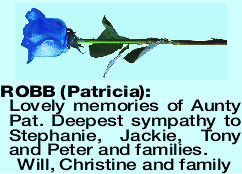 Deepest sympathy to Stephanie, Jackie, Tony and Peter and families. 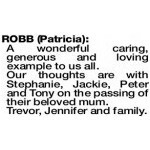 ROBB PAT Deepest sympathy to Steph, Peter, Michael and the Robb family. Loving Aunt to Jenny and Gail. Our thoughts are with you all. 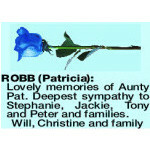 ROBB PATRICIA Loving memories of Dear Aunty Pat. Forever loved and sadly missed by Delys, Peter, Robyn, Mark, Stacey, Sheree and families. 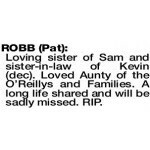 ROBB PAT Beloved sister and sister-in-law of Ian (Bill) (dec) and Adelaide (dec). Deepest sympathy to Stephanie, Jackie, Peter and Tony and families. A kind and generous heart. 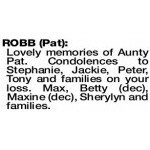 ROBB PAT Lovely memories of Aunty Pat. Condolences to Stephanie, Jackie, Peter, Tony and families on your loss. Max, Betty (dec), Maxine (dec), Sherylyn and families. ROBB PAT Happy memories of Aunty Pat in Collie. Condolences to Stephanie, Jackie, Peter and Tony and families on your loss. A wonderful caring, generous and loving example to us all. Our thoughts are with Stephanie, Jackie, Peter and Tony on the passing of their beloved mum.